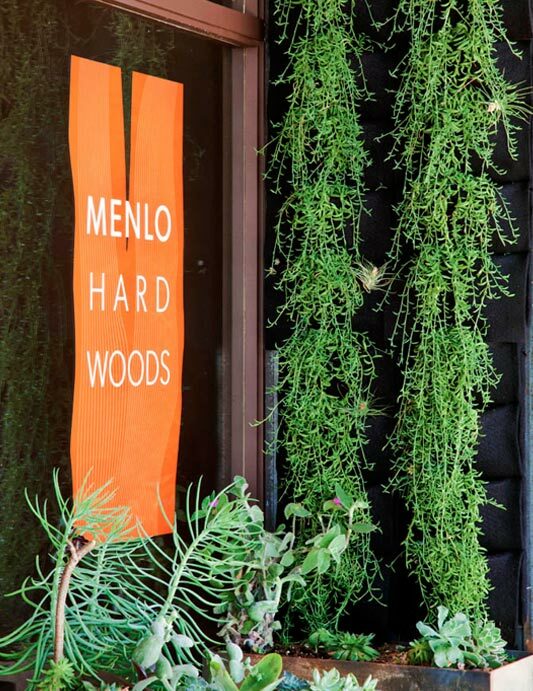 The name of the new store at 846 Santa Cruz Ave. in downtown Menlo is Menlo Hardwoods. But don’t go looking for samples of hardwood flooring. Instead, encounter a stunning array of hand-crafted solid walnut furniture made into dining, kitchen, coffee and library tables, bar tops and center islands. You will also find a sophisticated array of household accessories in a setting that could be as at home on Fifth Avenue in New York City as Santa Cruz Avenue. Menlo Hardwoods owners are George Bazlamit and brother-in-law Mike Balat. The boys grew up in San Francisco. Both their families were in trades. Mr. Bazlamit runs the store in Menlo Park and Mr. Balat, a custom cabinet maker for 25 years, works in Modesto crafting furniture from reclaimed walnut trees. Well-to-do clients and their designers keep the store busy. “Right now, we have 11 custom tables Mike is building. Eighty percent of our work is custom. We do a lot of tables for Tahoe,” says Mr. Bazlamit. A black oak burl adorning one wall will soon hang in a wine cellar in Pebble Beach. A table is awaiting shipment to Rancho Mirage. Along with the stunning display of woods is a delectable assortment of home accessories. A rack holds table lines from Belgium. There are gorgeous ivory papier mache bowls, handsome quartz specimens in amethyst and white, Heath ceramics, table displays of succulents, cutting boards and spoons of Clara walnut, candles in recycled wine bottles, wrought iron candlesticks, and a selection of coffee table books. The best selling book so far is “Guide to Urban Moonshining: How to Make and Drink Whiskey.” “We’ve sold a ton of these,” says Mr. Bazlamit. If your experience with hardwoods has only been those hippie redwood burl tables sold at flea markets, you owe it to yourself to visit Menlo Hardwoods. This unique store is one of the reasons Menlo Park is becoming an important destination for home decor.